It was quite , it was very clean , the owner gave us good information about what to do in the city. Good location. The apartment was so clean and comfortable, I couldn't believe how gorgeous it was! The entire apartment was perfect and the view of the Cochem Castle directly across from us made sitting on our lanai, drinking the free bottle of wine that the manager left for us was like living the dream! Extremely comfortable. Loved the shower! And it was great to have an elevator . And the hostess was most helpful. Would stay here again. The appartment was very nice, good furniture, clean and looked really good. All promised was there. One of the best we have seen in our trips abroad. Owners were very kind and nice to talk to. It was spatious and the hostess was very nice. It was so clean we thought we might have been the first to occupy it! Very quiet, must be well sound proofed. The power up/down blinds were a feature well above this price point. Excelent apartment. Very modern and extremely clean. Spacious room and bath, comfortable bed and a big living room, integrated with a very well equipped kitchen. Building with elevator and parking spot. Very kind host. The location is very convenient, walking distance to the center and castle. Lock in a great price for Villa Sonnenblick – rated 9.6 by recent guests! 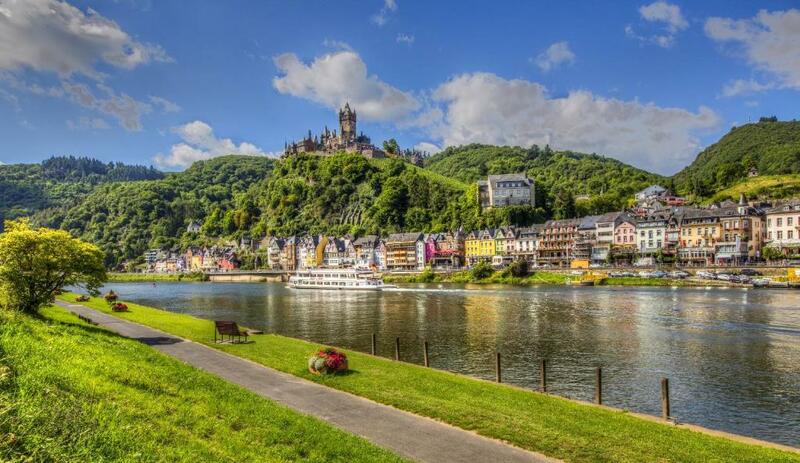 Located 2.8 miles from Cochem Castle and offering free WiFi, Villa Sonnenblick provides accommodations in Cochem. Each unit comes with a sofa, a seating area, a flat-screen TV, a well-fitted kitchen with a dining area, and a private bathroom with a hair dryer. A dishwasher and coffee machine are also available. Hahn Airport is 26 miles from the property. 뀐 Located in the top-rated area in Cochem, this property has an excellent location score of 9.2! When would you like to stay at Villa Sonnenblick? House Rules Villa Sonnenblick takes special requests – add in the next step! Villa Sonnenblick accepts these cards and reserves the right to temporarily hold an amount prior to arrival. Please inform Villa Sonnenblick of your expected arrival time in advance. You can use the Special Requests box when booking, or contact the property directly using the contact details in your confirmation. The host even prepared the wine for our arrival which is lovely. Everything was great and having a beautiful view of Cochem castle at anytime of the day and night was a bonus! Wish they had more toiletries, towels, toilet paper and was clothes. nice place ,nice view ,nice staff . Absolutely nothing! The apartment was amazing as was the view! We didn't want to leave! Extra comfortable bed, spotlessly clean apartment and lovely host. Clear and precise communication. Easy check in / access. Very Clean. Modern. Spacious design. Full of light. Quality fittings and furnishings. Fantastic views. We loved the whole experience. Superb apartment, great location, modern equipment in the apartment, great balcony, the hostess was amazing and answered all our questions. I can highly recommend this location!